An explosion in the capital of Oslo, Norway, followed by a shooting at a youth camp shook the country on Friday. Immediately deemed an act of “terrorism,” blogs, reports, and hearsay worked to effectively place the blame preemptively on the shoulders of Islamic “extremists.” Reports blamed the attacks on a number of groups: Gaddafi, al-Qaeda, the Palestinians, et al. Positive that Gaddafi was acting on his threat to “bring the war to Europe,” (1) or that al-Qaeda had decided to act in retaliation on one of the EU’s “more peaceable” countries for their involvement in the occupation of Afghanistan(2), rumor and gossip spread about the “terrorist atrocity” that had led to the death of 93 Norwegian citizens. All of this speculation sounded the same tune: “blame it on the brown people.” When the Norwegian police finally discovered the truth behind the conspirator, the party responsible was not a coalition, it was not an Islamist faction, it was not a leftist group, and it was not a foreign attack on European soil. Quite the opposite: it was Anders Behring Breivik – a white, Christian, Norwegian reactionary acting on right-wing political motivations against what he saw as the “radically left” Labour Party in power in Norway and the invasion of “Muslim” and “multicultural values” into “white European heritage”. Despite the emergence of of Breivik as the suspect, the following day’s cover of Sun tabloid read: “al-Qaeda’s massacre: Norway’s 9/11,” showing us that demonizing others is the most effective way to shift the blame to somebody else. It was not just the radical right that blamed the attack on “radical Islam:” First World “leftists” and “left-wing” political parties were also quick to place the blame on Islamic militancy, implying that the Islamist movement is the only movement capable of such a horror. First Worldists tend to discredit themselves when it comes to this assumption, since imperialism is the real “terrorism.” When we reflect on the reactionary and racist notion of the “terrorist,” it’s easy to see that far too often, First Worldism and the politics of its people jump to the racist conclusion that a “terrorist” can be nothing other than a Muslim, furthering the jihadist movement(3). This is not the first case where the racist stereotype has been wrong, but rather than changing the preconceived notions of what a terrorist is, liberalism continues the reactionary policy of disassociation with “radical” right-wing “terrorism.” Conservative hotspots are now trying to detach themselves from the man who has such an affinity for these movements. Alex Jones, the renowned “Libertarian Constitutionalist,” continued to blame Al-Qaeda even after the suspect was found to be of Norwegian nationality, stating on his Prison Planet website that a “white Al-Qaeda” is to be blamed. (4) The anti-Muslim blog “Little Green Footballs” released a post separating themselves from Breivik after it was found that Breivik had been citing the column in his racist blog. The actions of Timothy McVey, Jared Lee Loughner (who took his assassination cues from Sarah Palin’s “Target Map”), Charles Manson, The Knights of the Ku Klux Klan, the Ruby Bridge incident, and other examples of right-wing extremism were also not the actions of a Christian or a conservative? It seems like the right is having to distance itself from too many movements for it to be a simple coincidence. The truth is that imperialism, fascism, and right-wing hate groups fuel sentiments of animosity towards other groups, and when people react violently to this coaxing, the right is the first to denounce him with the reply “no respectable Christian/Republican/First Worldist/etc would ever commit such horrific acts, only Arab/Muslim/Third World/poor people would have the Satan inside them to commit such an atrocity. Whereas the Third World fights to survive, Breivik fought to “protect” his twisted Eurocentric nationalism, a theme that is professed far too much in the right-wing corporate media. So why is “preserving European culture” any more racist than “preserving American values?” Well, the answer is because Breivik is crazy, whereas the rest of the right-wing world is simply “patriotic” or “concerned.” At least, that is their reasoning behind it. It is also interesting to note the difference in reaction to al-Qaeda and the Breiviks of the world. Al-Qaeda became, for the people of the First World, the “nature” of Islam. Islam was blamed for being a “religion that professes hate” and “encourages violence.” Groups like Little Green Footballs claim that “Muslims are terrorists until proven innocent,” but when a radical nationalist professes hatred and kills almost 100 people to promote “white European culture,” he simply represents himself. He acted mistakenly and the right does not profess hate. Once again, that’s what the right says. Overall the racism that placed blame on al-Qaeda was a reflection of the racism that plagues the First World. The attack itself purveyed the intolerance that was so quickly exposed by those who observed the tragedy. 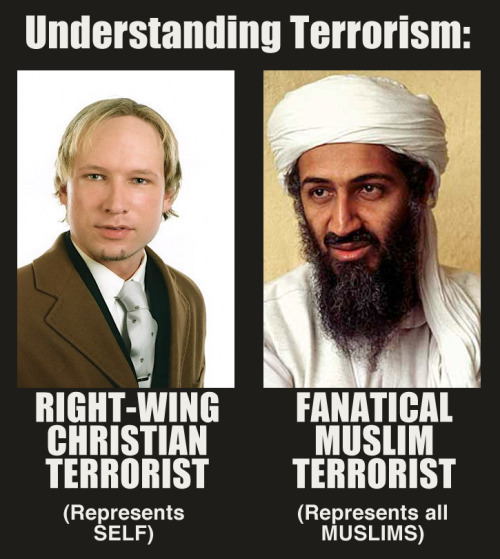 Breivik was seeking to show that Islam was “evil” and tainted “European values,” and people bought it, because they claimed that such an act of malice could only be committed by al-Qaeda and all the Muslims that profess their “religion of hate” instead of the truth, that their fascism, imperialism, and First Worldism are the worst example of “terrorism” that the world has ever seen. Again on south Sudan – What does this mean? Labor Party is a huge party that has ruled Norway since World War II – a hypocritical and imperialist party with socialist mask. They are behind the bombing of Libya and occupation in Afghanistan. Unfortunately, now this hypocritical party receives tremendous support after the terrorist attack. This will result in significantly less space for anti-imperialists, and there will be more dangerous to attack the government now… The state will attack anyone who agitate for the people’s armed struggle. This in turn will force us to fight in a different way.